When I was in high school, I was heavily involved with community service. My school did not have a community service requirement that had to be fulfilled in order to graduate; I simply did it for the satisfaction of knowing that I was helping other people. I knew I wanted to make this a part of my college experience, so I was excited when I received an email from the University of Richmond’s Bonner Scholars Program, suggesting that I should apply. The Bonner Scholar Program consists of hundreds of students at 27 different universities across the United States who are anxious to help and serve their community. When the program was founded, it was noticed that students generally had to choose between working part-time to help pay their tuition or doing community service. Since the Bonner Scholar Program provides a stipend for completing a certain amount of volunteer hours, students no longer had to choose; they could have their cake and eat it too. Since it did seem like the best of both worlds, I decided to apply and was accepted! Since I did not want to put my service on hold for a semester, I decided see if there were any non-profit organizations in Maastricht that would like to have an extra volunteer. I found that it was very difficult to find non-profit organizations in Maastricht. Maastricht is not a very large place (a fair amount of people bike or walk around Maastricht on a daily basis, since it is small enough to easily navigate by foot). Also, I discovered from a Bonner who previously went to Maastricht to study abroad that doing voluntary service work is not as common in The Netherlands as it is in the U.S.
With that being said, I was more determined than ever to find a place to serve. With the help of the director of the Bonner Scholar Program, I was finally able to get in contact with a place in Maastricht — Books4Life. Books4Life is a non-profit organization in Maastricht (and Amsterdam) that sells books and gives the proceeds to charity. The majority of the proceeds go to Amnesty International, and a smaller portion goes to a local charity that is chosen by the B4L staff. Everyone has been very welcoming to me here and I enjoy being here. I get to meet and interact with people from all over the world who are here as exchange students. I even had the privilege of seeing an award-winning book from a special collection in the local library! 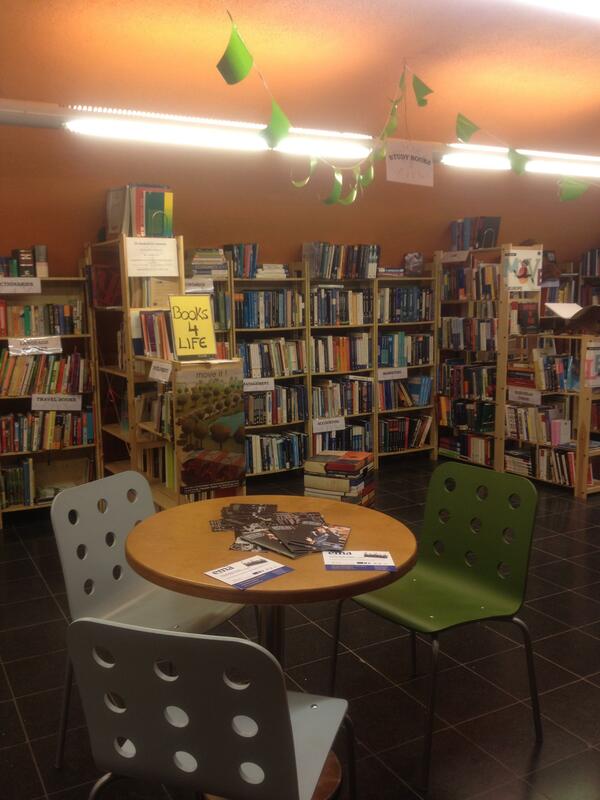 If you’re looking for a laid-back place to meet up with friends or buy a variety of books, then B4L is the place for you. I’ve thoroughly enjoyed my time here so far and recommend B4L for any future Bonners who may come to Maastricht. This entry was posted on Friday, March 16th, 2012 at 4:37 pm and is filed under Spring 2012, Whitney in The Netherlands. You can follow any responses to this entry through the RSS 2.0 feed. You can leave a response, or trackback from your own site.